Messiah Foundation International and ALRA TV are proud to invite you to a morning with world-renowned Sufi Spiritualist Younus AlGohar, the CEO of Messiah Foundation International! 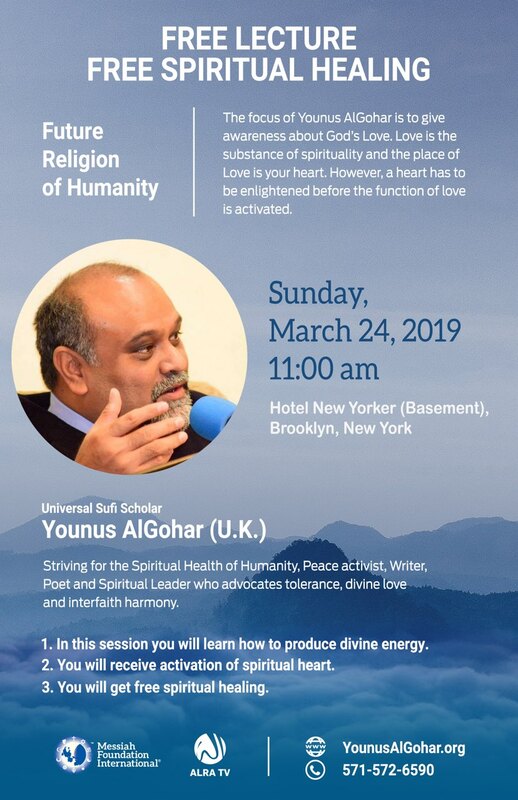 On the 24th of March, 2019, Sufi Spiritualist Younus AlGohar will deliver a lecture on The Future Religion of Humanity at the Hotel New Yorker in Brooklyn at 11:00 AM. Participants will receive free spiritual healing and activation of the Spiritual Heart. They will also be taught how to produce divine energy through the special method from His Divine Eminence Gohar Shahi.